Mathematics has often been characterized as the most conservative of all sciences. This is true in the sense of the immediate dependence of new upon old results. All the marvellous new advancements presuppose the old as indispensable steps in the ladder. … Inaccessibility of special fields of mathematics, except by the regular way of logically antecedent acquirements, renders the study discouraging or hateful to weak or indolent minds. In Number and its Algebra (1896), 136. 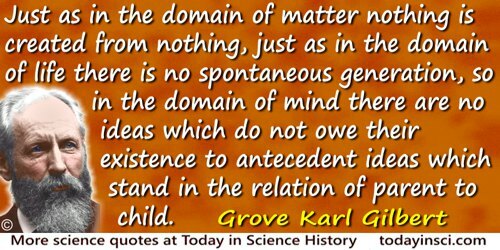 The validity of all the Inductive Methods depends on the assumption that every event, or the beginning of every phenomenon, must have some cause; some antecedent, upon the existence of which it is invariably and unconditionally consequent. A System of Logic: Ratiocinative and Inductive (1843), Vol. 2, 107. … if the consequences are the same it is always better to assume the more limited antecedent, since in things of nature the limited, as being better, is sure to be found, wherever possible, rather than the unlimited.